The Summer Eights 1st crews and coaches at the boathouse. M1 fell two spots from the Headship at the hands of heavily reinforced Keble and Christ Church crews but had no trouble defending their position at 3rd ahead of Pembroke on Friday and Saturday. W1 raced six times. Thursday saw a dog fight with Somerville to stay in the first division, they broke overlap several times before finally conceding on boathouse island. Friday saw an easy rowover at the head of division two followed by a more disappointing chase in division 1. 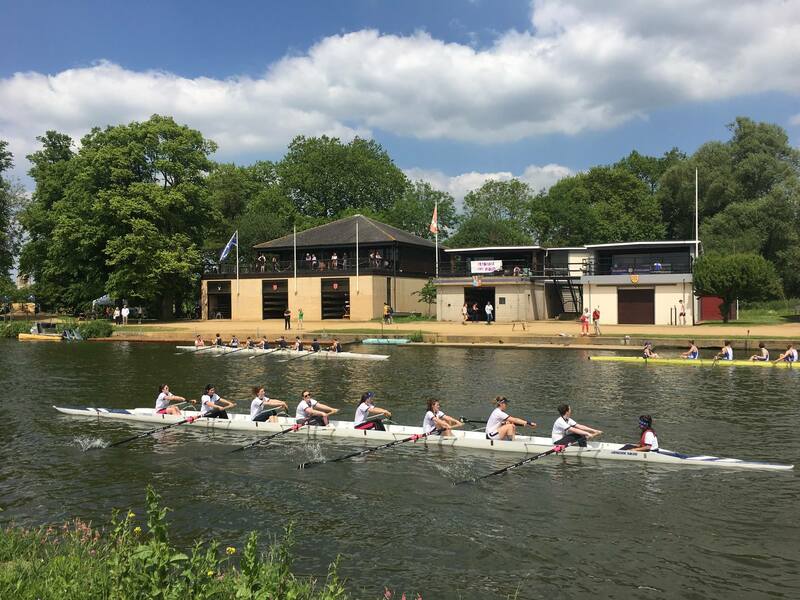 They found their fire for Saturday and put together their best race of the week in division 2 then closed to a foot on the Somerville crew in division 1 before having to settle for the rowover. -1 overall. M2’s challenging year was reflected in the results this term. They started out from a tough position in division 2 surrounded by other colleges’ first boats. They were bumped every day and ended the week -4 but did retain our standing as the second highest M2. W2 dispatched New II and Regent’s Park I to make it a nine-bump streak this year. On Friday poor coxing in the boat ahead led to a klaxon. They were frustrated once more on Saturday, theirs had the makings of a thrilling race, they had absorbed heavy pressure from a Green Templeton crew behind and had begun to pull away and had overlap on the Hertford II crew ahead as a klaxon sounded to halt the race. +2 for the week. W3 had speed and bumped Magdalen III but, like W2, suffered from two of their races being klaxoned so they were only able to move +1 overall. M3 was the crew for all comers: alumni, a fellow, ex-M1, ex-W1 and ex-W2 and novices all featured in the line-up at some point during the week. Their horizontal line on the bumps charts belies some exciting racing, the pinnacle of which was Friday’s rowover. Jesus IV behind them had already moved up six places and they pushed Oriel to a very close race but were unable to shake us from sixth in division 6. M4 got off to a bad start by being quickly bumped by Somerville III on Wednesday but were handed a second chance as Somerville banked on day 2 and Oriel took the bump by a row-past. On Saturday they grasped their final opportunity with enthusiasm and bumped St Antony’s III to end the week +1 overall. Many thanks to everyone who came out to support and who sent us good wishes through the week.